Penske launched the pilot last week on the website of Audi Tysons Corner. When a customer clicks on a nameplate, all matching vehicles in stock appear, with Preferred Purchase icons to the right. DETROIT -- Penske Automotive Group Inc. is launching an online sales pilot program it calls "Preferred Purchase." The pilot this week will be available on the websites of five Florida stores and six Washington-area stores. Penske has 244 dealerships. Preferred Purchase enables customers to handle most of a transaction online, which trims the time spent in a store, said Michael Kabcenell, Penske's director of strategic initiatives and business development. It also improves pricing transparency by allowing a customer to research vehicles, start a purchase or complete most of the purchase from home. "We want to give customers the process they want," said Terri Mulcahey, Penske's senior vice president of marketing and business development. Penske's Preferred Purchase, which links a dealership to the sort of online options available from third-party shopping sites, is the latest in online sales programs being developed by large dealership groups. Lithia Motors Inc. is testing technology dubbed The Sales Evolution in three dealerships. In December, AutoNation Inc. launched its AutoNation Express in South Florida. That initiative converts the company's websites from informational to transactional and aims to make buying a car more like purchasing other products online. Penske worked with various vendors to develop the software, and tested it for eight months, Mulcahey said. Penske launched the pilot last week on the website of Audi Tysons Corner in Vienna, Va., one of the Washington-area stores. Say a customer on the store's website clicks on an A4 sedan. All new Audi A4s in stock appear with their sticker prices. 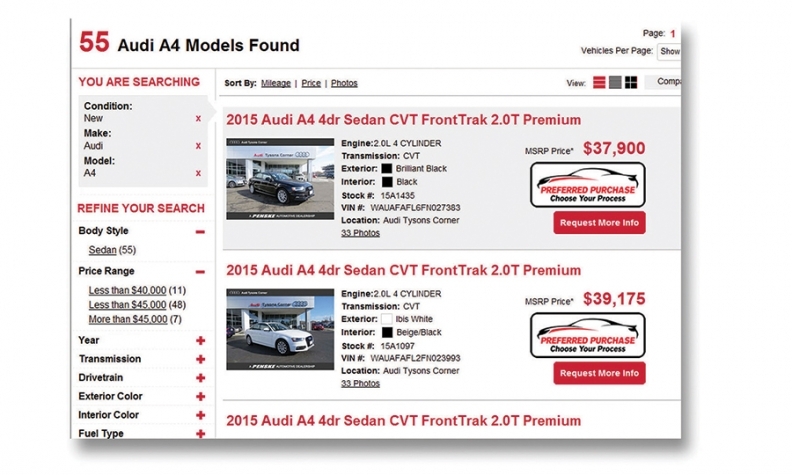 If the customer then clicks on the Preferred Purchase icon to the right of the A4 photos, a menu appears, offering several options: chat with a sales associate, connect with the dealership via phone or proceed with online options, such as getting an instant trade-in value estimate, exploring payments or getting loan preapproval. There's still human involvement. Even if a customer wants to do as much of a purchase as possible online, the store still has to send documents to be signed, physically evaluate the value of a trade-in, have a staffer present finance and insurance options by phone or in person and make arrangements for delivery at the store or elsewhere. Penske developed the program based on customer feedback, including that from a centralized customer relationship management system it launched a year ago. Penske will monitor the pilot for an undetermined period before deciding whether to expand it. "It's never perfect. We're going to constantly tweak it and we're going to make changes to it as we go," said Tony Pordon, Penske's executive vice president of investor relations and corporate development. With Preferred Purchase, customers do not have to give contact or personal financial information to get pricing information. "Our customers have told us that they want choices," Pordon said. "Some may want to buy the car online, some may want to have integrated chat, some may want to do research and get a payment and value a trade-in, but then call the dealership to solidify everything. We've tried to encompass all of those preferences into the site." Penske, of suburban Detroit, is the nation's second-largest dealership group on the Automotive News list of the top 150 dealership groups based in the U.S., as ranked by new retail unit sales in 2014. AutoNation, of Fort Lauderdale, Fla., is No 1 and Lithia, of Medford, Ore., is No. 8.